What’s a fun and free fitness activity you can all play together over Thanksgiving? The middle school near my house has a public exercise circuit, Parcourse or fitness trail — you know, the ones with the metal posts showing exercises like in this picture, and sometimes there are benches or bars where people can do exercises. VitaCourses (a brand name of exercise circuits), Parcourses, and/or fitness trails are all around the country, so wherever you are on Thanksgiving, you can find one near you. Kids have formalized playgrounds. VitaCourses are kind of formalized playgrounds for adults that kids can do, too. Go try it, it’s fun! 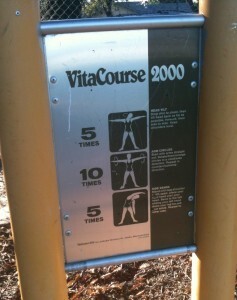 I used to push my daughter to the school in the stroller for my warm-up, then get her out of the stroller, and she would do the VitaCourse stations wit h me as a game. Now that she is older, she rides her bike to the track and challenges me to the circuit. It’s easy to stand there and watch her play, so I remind myself that it’s more fun and healthier for both of us to move through the circuit. 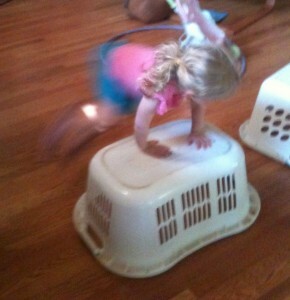 Her step-ups and push-ups are as hard for her as they are for me based on our weight and size. She thinks these are the most fun things in the world because we are doing it together. I’m not talking on my phone. I’m not checking email. I’m outside with her; we’re doing the exact same thing – making up crazy movements around the course, creating lasting memories for both of us. Oh, and we’re also getting a great work-out. Family fitness indeed! Can’t find a circuit near you? Try some of these games over the holidays instead: active vacay, object race, hand slap plank game or scavenger hunt. 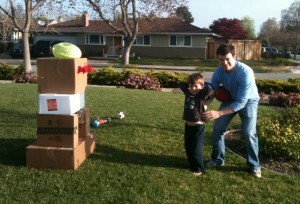 Have a game or activity your family loves? Take a picture! 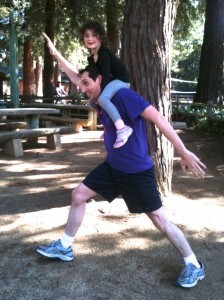 Focus on Family Fitness has a contest coming up for the best active family photo. Details are coming! I’m tired. I don’t know if I know anyone who isn’t. Maybe it’s the news; maybe it’s the endless dishes; or laundry that grows like a amorphous blob, but I’m tired. September is National Yoga Month. Seems like a good time for some restoration, relaxation, and Child’s Pose among the back-to-school chaos. I like yoga. I’m not a crazy-over-the-top fanatic like some Yogi’s I know, but I respect it as an ancient practice that brings incredible mind-body awareness, inner and outer strength and peace, and a discipline that improves over time. I don’t want one more thing to do. I do want high quality time with my family that doesn’t involve technology, that does involve health and fitness, and is interesting and challenging for us all. Recently, I borrowed some yoga books from the library. I was already doing some basic poses with my children but, since they are four and six, the visual books was helpful. Plus the provocation was coming from the book rather than Mom. Going to the library can feel like one more thing though, and the point is simple. Easy. Soothing and refreshing. There are tons of websites that detail yoga poses, but to start, pick one or two. Make it your pose. Have your kids find their favorite. Kids usually love downward dog. 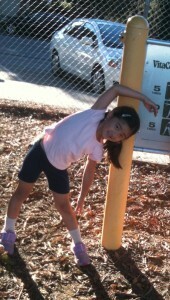 My children love tree pose, but pretend there is fruit on the tree. They like to do their own variations. There are books for young toddlers, and books for teens. I like The Girls Yoga Book by Michaela Caldwell by for Tween Girls. Do it after school when you haven’t quite moved into an activity. Try it while the toast is browning for snack. Try it daily or whenever the mood strikes. Just, well, as the saying goes, just do it. Imagine if the whole world was taught from a young age a go-to exercise we did for calming and comfort, for settling our mind and strengthening our bodies. Imagine if that same exercise was our go-to quick exercise for our whole life. Perhaps the news wouldn’t be as depressing. Perhaps resolution would be found in other ways. Many people have seen this video of the man who can’t walk without the help of crutches, who practices yoga, and then… watch it here if you haven’t seen it. Start practicing yoga. Like all exercise, it’s a great use of time. 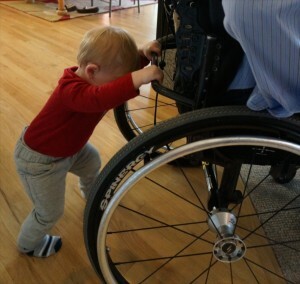 I can’t help it — the back of my mind is always thinking of new ways to inspire people and families to exercise. I also have a quiet love affair with TED talks, and watched one recently about how if the five senses are incorporated into product design, the product is much more effective. (This talk is meant for adults.) See it here. It started me thinking about how exercise can incorporate the five senses, and can easily be a top experience of our day or week. Think about a fall hike in the woods after a light rain. How does it effect our five senses? A scenic hike is incredibly fulfilling visually. After a rain, the wet earth smells fantastic, the crunchy leaves beneath feet are full of sound, the feel of the your body exercising and sweating goes from our head to our feet, and the cold water and snack mid-hike taste refreshing. 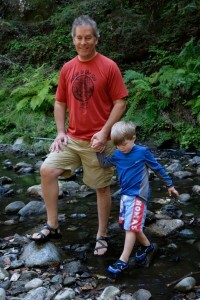 All five senses stimulated in a simple, free mountain hike. How about a bike ride/skate board to a local coffee shop? Even an aerobics class can stimulate our fives senses to different degrees. Our hearing, vision and touch senses are all high. Smell, well, hopefully that’s the sense least stimulated, unless the drink you are hydrating with has a good smell. Taste? That water bottle hits the spot. When I taught spin class last week, I brought them all chocolate. All five senses activated and great fun. While not every sport can rouse all five senses perfectly, the more senses involved, the more pleasurable the experience. And all this doesn’t even take into account the incredible bonding time with your friends and family, the conversations, the feeling of playing on a team, the endorphins from movement, and the thrill of a new sport or winning a game! Someone in my family is an incredible puzzle master. He can solve almost any puzzle, and does it with joy. He doesn’t really like exercise though, and while he understands why he should exercise, he doesn’t gravitate toward it. As I watched my children in gymnastics or kicking a soccer ball, it became very apparent to me that exercise is really a puzzle. Instead of manipulating a little wooden piece into a peg, or a metal ring through another, athletes turn their bodies in different ways to get them to “fit” into a cartwheel or kick a goal. As I teach different age clients about how to exercise, we measure heart rate, quantify times, chart successes, tweaking the “puzzle” so their bodies can go faster, stronger, quicker or more efficiently. What starts as a body-puzzle of a successful lunge, becomes a real-time, highly individual math equation, statistics and science game all at once. Putting aside for a moment that exercise is the only way to grow more brain cells at any age, and that exercise makes our bodies healthier, happier and an infinite of other positives, why are sports, physical education and gross motor time being taken out of schools? How come we teach the map of the world but not the map of our own anatomical and physiological bodies? Why do parents hire math tutors for their children, but disregard the free teachable times of everyday movement? What if parents triedhopscotch hiccup for teaching addition, subtraction, and multiplication, playing it with their children, everyone moving and learning together? How would weekends look if parents had jump rope contests alongside their neighbors, so all were moving their bodies through a dynamic, fast-changing puzzle? Imagine the educational and fitness possibilities of running scrabble, creative scavenger hunts, or Letterboxing. 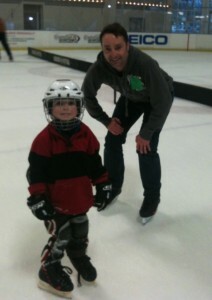 The teachable moments are all there for ourselves and our children; we just have to start. Maybe that’s the hardest part of the puzzle. When you are exercising, no matter what activity you choose, think about varying it to keep your body from stagnating. How? The acronym “FITT” sums up what to do to continually grow stronger and healthier. The “F” stands for Frequency. How often are you exercising? You want to move as much as possible and all movement counts! Additionally, if you can, you want to work out so hard you are sweating and out of breath at least three times a week. I realize this sounds crazy, but I’m talking “ideal”. If you do it as a family, you’ll have exercise and family time all together! For example, the mom in this picture regularly went running with her son in a stroller, did strength training with me, and went on a reality tv show less than a year after child birth. Oh, and she works full-time as a biologist too. Mix “FITT” exercise with family time and anything can happen! The “I” stands for Intensity. This couples with what I said above about sweating and being out of breath. How intensely are you exercising? On a scale of 1-10 with 1 being the easiest and 10 being the hardest, you want to be sure you work around level 6,7,8 and even 9 sometimes -depending on what your goal for the workout is. Short bouts of REALLY intense exercise can be incredibly effective! Think jumping rope or super squat jumps (doing a squat, then jumping in the air landing back in a squat). It can be just for a few minutes, but interspersed throughout your day and week, you’ll have some real cardiovascular and metabolic improvement. Sometimes short super intense bursts are great, sometimes a long sustained walk/jog is great. Know that they all have wonderful attributes and you can weave them into your fitness plans to keep your body changing. Click on cardiovascular activities on the blog for more ideas of what to do. “T” stands for Type. What type of exercise have you chosen? Walking, swimming, biking and dancing are great! But what if you don’t have time/resources for anything other than the chair or bathtub exercises? Then just vary the type of things you do, such as lunges, squats, push-ups, step-ups, step-downs, sideways jumps, etc. The last “T” stands for Time. How much time do you have to spend on your activity? Five minutes? Go hard! Five hours? Enjoy the movement! Vary the speed you do squats or jumps or whatever the move is. Fast squats are great for a cardio challenge. Slow squats are great for muscle work. Keep changing the timing (or tempo) of your exercise. Vary any of the Frequency, Intensity, Type and Time and you’ll have the recipe to keep your workouts interesting, your body challenged, and your mind happy! The second game is a fitness memory card game called Bakari, where you match two physical activity cards and earn points by doing the exercises. See the games here at flip2bfit.com. 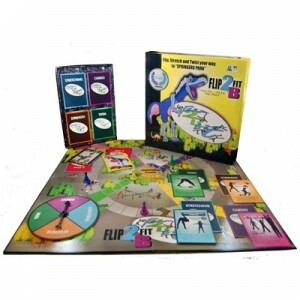 Add the Flip2bFit games to the others on this blog (like active Charades, Twist It Up, Running Scrabble, body Rock, Paper, Scissor, etc.) to play for family game night. 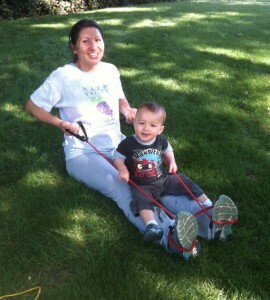 Over and over, Focusing on Family Fitness is easy to do when exercise and activity are woven into family time.